[AUTO](VC/RC):When placed, this unit gets [Power]+10000 until end of turn. 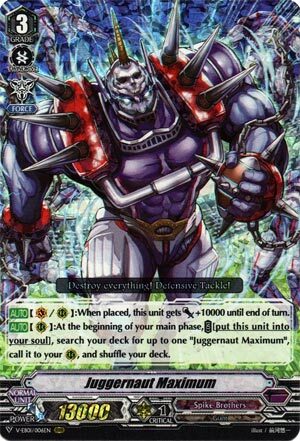 [AUTO](RC):At the beginning of your main phase, COST [put this unit into your soul], search your deck for up to one “Juggernaut Maximum”, call it to your (RC), and shuffle your deck. So like I said back in my Seifried review, you’ll have bad times if you must ride any other Grade 3. This was obviously meant to be a rear-guard, packing the same swapping call as Wonder Boy but gains 5k more power for it. At least it packs Force and so you can set up a RG circle until you can actually draw Seifried and try to claw back. But I don’t see any other alternatives filling in, so for now I guess this thing has to stay. Previous articlePokemon Go – Get an Eevee That Knows Last Resort on August Community Day!